One thing that isn't mentioned anywhere in the books I have is the question of blade length. Looking more carefully at the compressor design in Schrecklings book, I noticed that the blades are pretty well as long as possible. 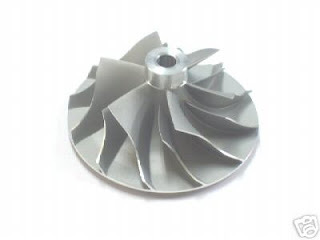 And looking at the design of turbocharger impellers, I can see that they are made with blades that extend forward along the axis, making them much longer than they would otherwise be. The blades of this Mitsubishi wheel are at least twice as long as my own design attempt. 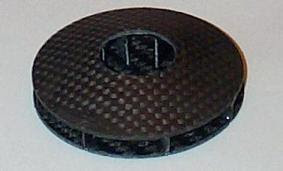 This photo was taken before I trimmed the wheel to size and opened out the inlet, reducing the blades even more. When I installed it and ran the engine up, there was a distinct improvement in response. Still not self-sustaining but about 20% higher ultimate rotational speed for the same fuel input. Unfortunately, something is tightening as the engine heats up to operating point. It frees as soon as the engine begins to cool but it's stopping me from making any real observations. That, and a hot spot in the combustion chamber, clearly visible in the exhaust need to be addressed before I can go any further. Found the cause of the tightening. The rear bearing hasn't quite enough axial play. There's a temporary packing between the turbine wheel and rear bearing that shouldn't really be there but I was using it to adjust the position of the wheel with respect to the NGV. When I removed it, the tightness went away. Some figures. When cold, the engine rotates at 15ms per rev with the hairdryer pushed against the intake (4000 rpm). Running, with the NGV glowing bright red - estimated 700 degrees C, the speed is 6ms per rev (10,000rpm). So that's an increase of 4:1 in speed for an (absolute) temperature rise of 990/290 = about 3.4:1, suggesting that some at least of that speed is attributable to an increase in massflow as the compressor spins up. I could be off in my estimate of the temperature but to account for a 4:1 speed increase on temperature alone (without an increase in massflow) would require a temperature close to 900 degrees.